Amy Jo Giles, Springfield, Illinois. Car defense, Amy is one of those gifted, born to do Krav Maga. I was amazed at how well my teacher knew me. After all he was not a psychologist, he was not the "warm and fuzzy" nurturing type, he was not even a university graduate. But yet his observations about my personality were right on the mark. Or as the British would say, "Spot on". Based on how I trained, and how I evaluated myself, he pointed out that I was very harsh. "You are very harsh on yourself, you do not give yourself a break. You do not forgive yourself your own mistakes. If you do not do a technique perfectly you are angry with yourself, you become frustrated." All true, guilty as charged. Good observation. But I have learned, I have trained myself, not to be this way with my students. I have to be more forgiving. We all have to be more forgiving to ourselves. Not because we are willing to settle for a lower standard, no, no no. Rather because we are different. We have different bodies, different personalities, different talents. I watch students, all the time. Some pick up the moves quickly, some look like me in another body. Of course this is pleasing and gratifying. They "got it". Great. They are true disciples, great. But this is not the case with all students, and it will never be the case with all students, and we must accept this. They discussed dating and marriage. Before long Jenny was quoting my mother, more than I do. "You know Moshe, as your mother says, you do not need perfection, you just need what is right for you. It is not about finding Mr. Right (for a woman of course) but finding Mr. Good Enough." The point here is that it is rare to find a student who is a duplicate of the teacher. And the fact is that many of our students simply will never do the techniques exactly as we want them do. We can bang our heads against the wall. We can fail them and deny them promotions but it will not change the fact; not everyone is the same. 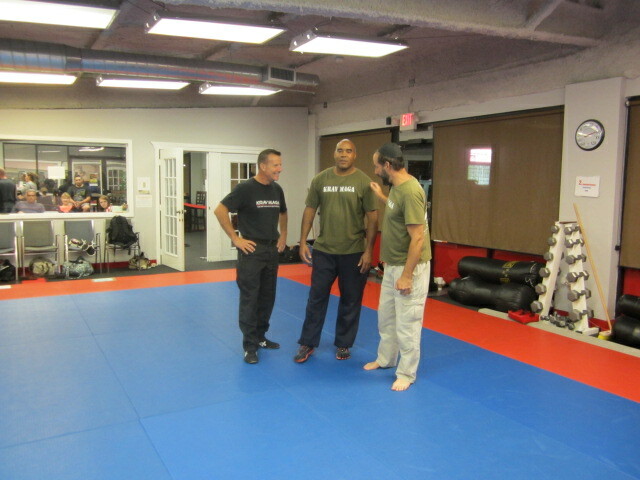 Chatting with IKI Instructors Wayne Tillman and Calvin Longton. They both always have important insights into our IKI Krav Maga techniques. The good news is that we do not necessarily have to totally control each and every student. We do not have to duplicate ourselves, not with our students and not with our children. I often say that in the unfortunate cases where our students have been attacked, two things have always been true; one: they succeeded, two: they did not do the technique perfectly. In other words, the way they did the technique in real-life, successfully, would not have been enough to pass a Krav Maga belt test. And yet, it worked. I take comfort in this. So when I watch a student and I feel, well, he/she is not doing it exactly the way I want them to do it, I remember that. I remember that the concept is more important than the "Perfection" of the technique. I remember what Jenny said in the name of my mother that sometimes Mr. Good enough is better than Mr. Perfect. So I try not to drive my students crazy in search of perfection. Sometimes Good enough is better then perfect. The search for perfection might wear them down and drive them away. As the Talmud says, "The overly strict teacher cannot teach." We incorporate the values of the Talmud into our style; IKI Krav Maga. Our style is built around the concept, not the perfection of a Kata (pre - arranged form), the goal is survival, not beauty. 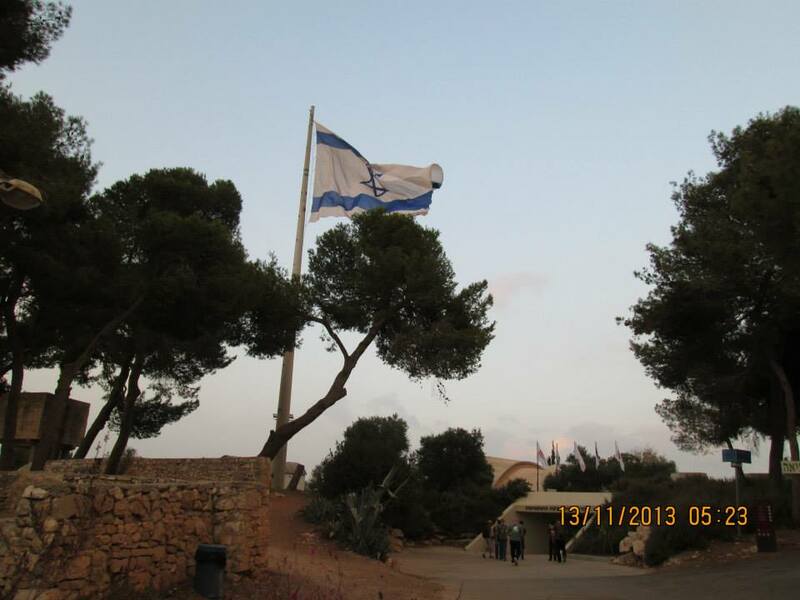 Our flag flies over Ammunition Hill, site of the one of the key battles for the liberation of Jerusalem. In Israel you will experience Krav Maga on a entirely different level. You will gain insights and deeper understandings. You will see your skills improve. The touring segments are chosen with Krav Maga in mind. See the connection between the past and the present, and the future. This is not your "Commercial Krav Maga", or your tourist vacation. This is Israel as we see it and as we live it. Airport pickup, accommodations, currency exchange etc can all be arranged for you.